Elizabeth City NC Personal Injury Lawyers | Outer Banks Car Accident Attorneys - Thompson & Pureza, P.A. One of the biggest risks we take every day in traveling by vehicle. Automobile wrecks can occur for many reasons including unsafe conditions, drunk drivers and defective equipment, sometimes leading to severe injuries and permanent disability. If you have been injured in car, truck or motorcycle accident, knowing your rights is important.You should not be responsible for hardships like lost wages and medical bills due to someone else's negligence. The attoneys at Thompson & Pureza are here to help. Call us at (252) 335-7200. Workers who are injured on the job in North Carolina may be entitled to benefits to help them cover the costs of living and medical expenses while out of work. In fact, all businesses in our state with three or more employees are required by law to carry workers' compensation insurance. If you are a regular employee, or even independent contractor and have been hurt while working, you should always speak with an attorney to make sure you are getting fairly compensated. If we can help, contact us for a free consultation. Have you accumulated too much debt? Would it be impossible to pay back? For those facing tough financial times, you may be able to file for bankruptcy, allowing you to reduce or renegotiate your debt while still keeping your most important assets. 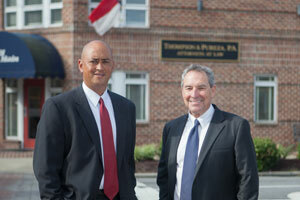 The attorneys at Thompson & Pureza can help with Chapter 7 and Chapter 13 bankruptcy filings. From filing the petition to settling with your creditors, we strive to make the process as simple and affordable as possible. C. Everett Thompson, David Pureza and their staff have helped thousands of individuals, families and businesses throughout northeastern North Carolina, with a variety of legal matters over the past several decades. They try cases in state and federal courts involving personal injury, wrongful death, bankruptcy, workers compensation, automobile and motorcycle accidents, trucking accidents, products liability, medical malpractice, corporate negligence, land disputes, commercial torts, premises liability, commercial and insurance litigation. Our lawyers have helped clients throughout northeastern North Carolina and the Outer Banks, including the cities and towns of Elizabeth City, Kitty Hawk, Nags Head, Corolla, Duck, Kill Devil Hills, Manteo, Hertford, Edenton, and the following counties: Camden, Dare, Currituck, Chowan, Gates, Hertford, Bertie, Hyde, Martin, Pasquotank, Perquimans, Tyrrell and Washington County as well as other surrounding areas. The attorneys and law office staff at Thompson & Pureza take each case personally, utilizing every resource available to obtain the best results for the client. Thousands of individuals, families and businesses have benefited from their years of experience, legal knowledge, aggressive representation and client commitment. If you have questions regarding your legal rights in any of our practice areas, please contact Thompson & Pureza at (252) 335-7200. If you or a loved one has been seriously injured in an automobile collision in North Carolina, you may have years of recovery and rehabilitation ahead of you. While you focus on getting better, let the personal injury lawyers at Thompson & Pureza fight for the compensation you deserve. If you have been injured on the job in North Carolina you may be entitled to workers' compensation benefits to help cover your living expenses and medical costs. In order to guarantee you are fairly compensated you should seek the legal advice of an experienced workers' compensation attorney. The bankruptcy attorneys at Thompson & Pureza are dedicated to helping the hard working people of northeastern North Carolina who have debts they are unable to pay back. Our firm has over thirty years of experience in handling Chapter 7 bankruptcy filings for clients who have been overwhelmed by their financial liabilities.